Every gardener’s biggest challenge is the quality of their soil. Some struggle with clay while others struggle with sand. Some fight wet soil and some wage war against drought. Whatever your challenges are, many can be overcome by adding compost to your existing soil. Compost is nature’s way of adding nutrient-rich additives that fuel your plant growth and restore depleted soil. It’s easy to make, good for the environment and a much-needed soil conditioner. The organic matter in compost provides food for microorganisms which keep your soil healthy. Nitrogen, potassium, and phosphorus will balance out your soil naturally by the feeding of microorganisms. Browns in the form of dead leaves, twigs, and branches. Greens in the form of grass clippings, fruit and vegetable scraps, eggshells, and coffee grounds. 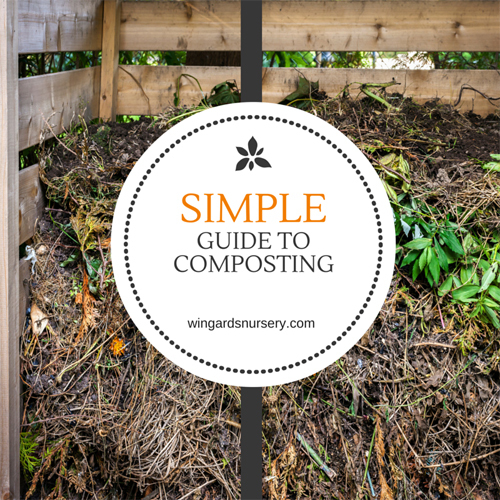 Combined with water, the greens and browns will produce healthy compost. The browns provide carbon for your compost, the greens provide nitrogen and the water provides moisture to break down the organic matter. If you are using the compost pile method keep your collection no smaller than 3’ x 3’. Aerate your pile every couple of days by turning it over with a pitchfork. Don’t let it dry out completely, it needs moisture to heat up and keep the composting process active. You don’t want it to be soggy; if it starts to stink it is too wet. Keep your pile balanced. Feed it equal parts of greens and browns. Improves the Soil Structure – A healthy soil should be crumbly to the touch. If your soil is hard and clay-like, young plants will struggle to get the nutrients they need to grow. If your soil is sandy, it won’t hold the nutrients required to survive. Adding compost will allow room for air and water to move more freely through the soil. Adds Nutrients – A thriving soil that is full of organic matter will produce vital nutrients for healthy plant growth. Retains Water Better – By adding rich compost to your soil, heavy soils are better equipped to hold water and reduce runoff and erosion. Compost added to sandy soils will increase the chances of the water reaching the roots where it is badly needed. Wards off Disease – Soils enhanced with compost tend to produce plants with fewer diseases. Composting will help control diseases and insects that might otherwise develop in sterile soils. Creating healthy plants is simple and the advantages of using compost to improve soil quality by allowing it to retain air, nutrients and moisture will result in more vigorous, thriving plants. Think of it this way…compost is black gold for your garden! If you are not ready to jump on board to create your own compost pile, stop by Wingard’s and pick up a couple 40# bags of our ready-made compost. Mushroom Compost – Mushroom compost is a type of slow-release, organic plant fertilizer. The compost is made by mushroom growers using organic materials such as hay, straw, corn cobs and hulls, and poultry or horse manure. Black Kow Compost – Black Kow is organic cow manure and contains nutrients that are released slowly without burning tender roots. 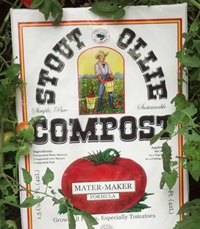 Stout Ollie Compost – A local South Carolina Company, Stout Ollie, starts building their compost with an annual plant material like the cotton plant. Stout Ollie adds two materials during the composting process that have proven their worth to mankind over millenniums. They are cow manure and fish. The manure is from their own herd of grass fed cows and the fish are trimmings from wild catfish caught in the Santee Cooper Lakes. They provide a wide range of those hard-to-get minor elements without the harsh chemicals used by so many producers. Here at Wingard’s Market we specialize in providing outstanding customer service, offer professional gardening advice, and answers to your everyday gardening questions. Stop by and visit our beautiful Gift Shoppe and Fresh Produce Market while you stroll under century-old pecan trees. It’s truly a Garden Wonderland!